Thanksgiving turned left this year. My kids are grown and many have moved away to embrace new opportunities. My mother-in-law is now 91, lives 2 hours away and increasingly finds the ride in and back home hard to bear. So this Thanksgiving we gave her the choice to have us bring dinner to her. That meant the few remaining adult kids and a friend of mine wouldn't be coming. However, her three sons and I would all be there to celebrate. She quickly said yes. I honestly don't often make turkey for Thanksgiving. When I moved to Canada from the U.S., I embraced the British tradition of having it at Xmas. I think their dinner is traditionally Xmas goose or duck, but turkey is in the same family, so it worked for me. Thanksgiving I chose instead to do a bone in ham. It makes great soup another day. As dinner had to travel in the car for 2 hours, I wanted to keep the meal simple. 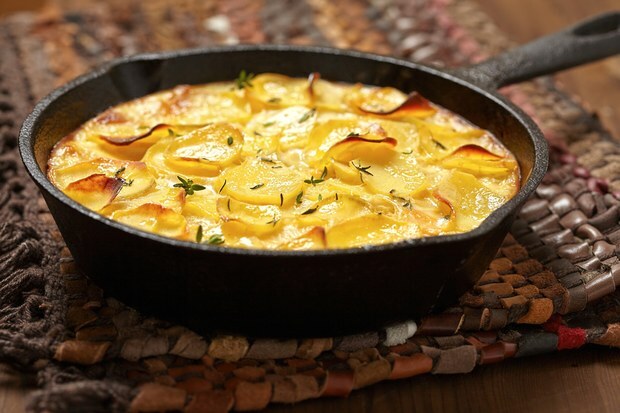 Scalloped Potatoes are easy, travel well and are great reheated. Then I took along fresh green beans to microwave just before the meal, some rolls and a pie from Costco. Done! The ham I cooked the night before, sliced into serving pieces and carefully packed. I had not made scalloped potatoes in awhile, so explored my options on the internet and chose to go with this recipe from Epicurious. I made one real change to the recipe (and a few small ones noted below) and that was to use Gouda Cheese instead of Cheddar. I love the more subtle flavour of Gouda in this dish. If you prefer more pop, make it a sharp cheddar - but use the white cheddar instead of the orange coloured version. 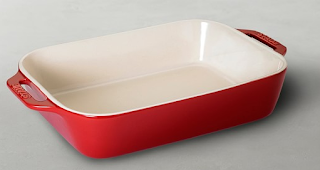 Unlike their photo above, I cooked mine in a 9 x 13 inch red ceramic casserole dish. It offered a beautiful pop of colour on the table. My only note of surprise when I made this was the layering. The sauce goes on the bottom instead of the top of each layer. I was worried this would make the top dry, but during the first half of the baking time when the dish is covered, the sauce bubbled up and over the top. This is definitely an old fashioned recipe in terms of taste - comfort food at it's best - and that was a hit with this older crowd. Everyone had seconds with few leftovers. It's going in my list of recipes for company dinners. Easy, tasty and mostly gone at the end. In a skillet saute the onion in 2 T of the butter over moderately low heat, stirring, until it is very soft. I let them caramelize a bit. The original recipe made the cream sauce on the stove top, but I made it in the microwave. Just easier and a lot less mess. Melt 6 T butter. Stir in the 6T of Flour. Whisk in milk making sure to scrape all the bits of roux off the bottom of the dish. Microwave on high in 2 minute, Whisk thoroughly again making sure there are no bits of roux stuck on the bottom anywhere. Then continue in 1 minute intervals. Between each, whisk the cream sauce thoroughly. Continue until thickened. Slice potatoes 1/8" thick. The original recipe peeled them, but I prefer the skin on for nutrition and to add to the look of the dish. Spread 1/3 of sauce in the bottom of a 3-quart prepared casserole or Au Gratin dish. Layer 1/3 of potatoes on the sauce. Top this with 1/3 of sauteed onions and end with 1/3 of grated cheese. Repeat 2 times. Sprinkle on bread crumbs and dot with last 1 T of butter cut into small bits. Bake the mixture, covered with foil, in the middle of a preheated 400°F. oven for 30 minutes (they did 20). Remove the foil and bake the potato mixture for 30 min. or until the top is golden and the potatoes are tender. Let set for a few minutes before serving as sauce will thicken more. Or cool and reheat later in low temp over covered with foil.